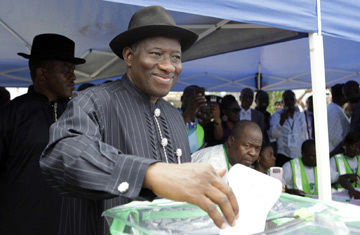 Will Goodluck Jonathan Bring Good Luck to Nigeria? At first glance, the election of Nigeria's incumbent President, Goodluck Jonathan, who took nearly 60% of the votes cast, signals more of the same. Jonathan's victory means another term for the country's dominant People's Democratic Party (PDP), giving it an unbroken four-term hold on power since the return of democracy in 1999. Since Jonathan is a Christian southerner, his win will rankle northern Muslims, so the Muslim-Christian violence that plagues Nigeria will continue. In fact, the latest bouts, in the northern cities of Kaduna, Gombe and Zaria, began even as results were being announced Sunday and have already cost three lives. Since Jonathan is a product of the PDP, and since the PDP practices systemic corruption, that too will endure. Nigeria, Africa's most populous country and the holder of its biggest reserves of natural resources, will likely remain a prime example of a curse that has stood the test of time: how nations blessed with natural riches often end up more corrupt and less stable  and ultimately, poorer  than others. Whether that doom-and-gloom analysis holds weight depends on Jonathan  and whether he himself offers more of the same. The good news is that there are several reasons for him not to. The biggest is demographics. Nigeria's high birth rate has produced an extraordinarily young country  the United Nations says 62% of the country is under 24  and that new generation is both increasingly unhappy with the ruinous ways of the aging elite and able to do something about it. Youthful energy alone is no guarantee of change, but channeled through social networks, powered by new resources bequeathed by an economy which expanded by 7.8% last year and multiplied by sheer size (62% of Nigeria's population equates to 100 million people), it might well be. The second, related reason is that Nigeria's is an improving democracy that increasingly responds to popular will. Though final verdicts from election monitors will take days, initial reports suggest these have been Nigeria's cleanest elections to date  and to the extent that Jonathan owes his election to the voters rather than PDP bigwigs, he might be expected to serve those interests in office. In addition, Jonathan has said he only wants to serve one complete term. If he sticks to that decision, the normal concerns of self-promotion within the PDP that has persuaded so many in the party to act in the elite's interest rather than the wider population's will have much less sway. Jonathan has, for instance, already signaled that finally delivering a reliable electricity supply to Nigeria will be a top priority of his presidency  something that would unsettle those in the elite who have become rich out of squeezing the power supply, and selling the country generators. Encouragingly, Jonathan would not be alone should he choose to strike out on the path of progress and reform. Since 2009, Nigeria has had a formidable Central Bank governor, Lamido Sanusi, who is cleaning up Nigeria's banks, and since 2007, the governor of Lagos, Babatunde Fashola, has made huge strides remaking Nigeria's megacity. The big question is leadership. As someone who initially came to power by default  Jonathan was installed when former President Umaru Yar-Adua died last year  the President-elect has had, until now, no popular mandate beyond winning the PDP candidacy. Perhaps as a result, he has been an unimpressive President, more given to conferring than leading, more a servant to figures inside the PDP than their master. For one of his advisers, former human rights lawyer Oronto Douglas, his popular election changes all that. "This is the dawn of a new era, the beginning of the rise and rise of the ballot over the bullet [and] of a new Nigeria where the power of the people will speak for the people and our country," he said. But another adviser, speaking in the run-up to the vote, was not so sure. "Nigeria's politics is ruthlessly pragmatic. You have to strike deals with some devils to become President. The question is, after the election, will the President feel strong enough to turn around and say: 'You know what? Thanks for your support, but I'm going to be my own man.'" Nigerians have put their faith in Jonathan. Will he put the same faith in himself? See why the election is inspiring new hope for Nigeria.